The weekend of August 26, 2000 was selected for our Turning 55 in 2000 Reunion Party. That’s right, the occasion warranted dedicating the entire weekend to the affair. 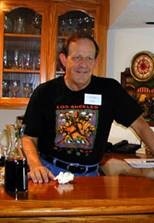 Of course, having our host, Carl Olson, willing to turn his home into everything from a vintage car garage to what became known as Carl’s Bed and Breakfast Inn, made it all possible. We started with a Wine and Cheese party on Friday night, followed by the main party Saturday, and culminating with a Sunday brunch. We invited virtually every graduating class that attended Leuzinger at some time during our class’ reign there, meaning the class of 1960-1966. 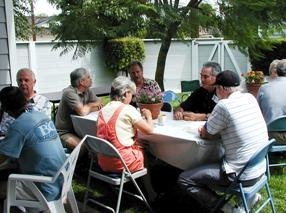 This format and grouping was a big hit with those who were able to come. About a hundred people came at some point during the three days, with many enjoying the good times on all three days. Forgetting about the great time we all had, and just considering the number of people who were able to come, we believe that it was a total success. We really did not begin to seriously plan or think about the event until last May. Mobilizing the other classes was a real challenge. Don’t be surprised if we don’t do something like this again! Below are a few of the photos that were taken during the weekend. These are just a sampling of the photos that you Clicking Here. If you have not already done so, visit there to get a flavor of what you missed or to remember the fun you had if you were one of the lucky ones who attended. 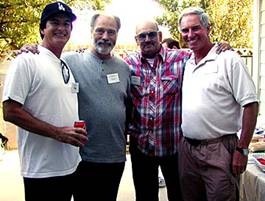 Our Host, Carl Olson Steve Cirillo, Terry Hansen, Lee McGeorge, and Wes Risor catching up after many years. 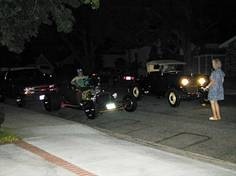 Carl’s Garage, driveway and adjacent street became the La Grande Concourse (pardon my French) for vintage cars and hot roadsters. 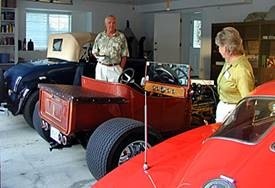 Dave Akins admires Dennis Hamilton’s roadster while Jeanne Weldon King seems to prefer Carl’s Vette. Not quite Lion’s Drag Strip or even a fair race. But there is nothing like a good street race to get the blood flowing, right Sylvia? Even after two days, many of us got up and headed back for the traditional Sunday Brunch to cap off a great weekend!